A great beauty who became an impressive actress, elegant redheaded Valerie Hobson landed some very choice roles in the later 1940s, and is perhaps at her best in those which permit her to exercise her talent for high comedy. 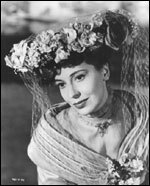 She originally trained as a dancer until she grew too tall and made her stage debut aged 15 in Ball at the Savoy at Drury Lane , where, symmetrically enough, she made her final acting appearance as the governess in The King and I (1954), for which she won wide acclaim and to play which she had to pass up the female lead in Father Brown (d. Robert Hamer, 1954). Her film career began in modest British films - in, for example, Badger's Green (d. Adrian Brunel, 1934) - before she took off in her teens for Hollywood where she made about a half-dozen films, of which only The Bride of Frankenstein (US, d. James Whale, 1935) is memorable. On return to England, there were a few more minor films before Technicolor made her a star in Korda 's The Drum (1938). She then had successes in two comedy thrillers, This Man is News (d. David MacDonald, 1938) and its sequel, This Man in Paris (d. MacDonald, 1939), produced by Anthony Havelock-Allan whom she married in 1939. For her favourite director, Michael Powell , she appeared to advantage in two popular wartime spy thrillers, The Spy in Black (1939) and Contraband (1940), establishing her as an attractive, ladylike but spirited heroine. Her postwar period of great achievement includes: a properly icy Estella in Great Expectations (d. David Lean, 1946); the passionate, ambitious heroine of Blanche Fury (d. Marc Allégret, 1947), her personal favourite; the priggish Edith in Kind Hearts and Coronets (d. Robert Hamer, 1949), an exquisite comic performance as someone who takes life very seriously; and the extravagant, cold-hearted Hester in The Rocking Horse Winner (d. Anthony Pélissier, 1949). Her last film, Knave of Hearts (d. René Clément, 1954), showed her again as a mistress of subtle comedy. She retired to marry politician John Profumo to whom she remained married until her death, weathering the security scandal of 1963, after which he resigned, and both spent much of their time in charitable work. The author David Profumo is their son.